AMD is the leading cause of vision loss among Americans over the age of 60. AMD is a disease of the retina (back of the eye) which leads to a loss of central vision. Although the exact cause of AMD is unknown, both genetic and environmental factors play a role. Specific risk factors include age, family history, and smoking. A Newsom Eye Retina Specialist can diagnose AMD during your eye examination. It is important that all adults over the age of 50 have an annual dilated eye exam to screen for AMD as visual symptoms may not appear until late in the disease. A dilated eye exam will reveal “age spots” known as drusen in the macula, which is the central portion of the retina. There are two types of AMD – dry and wet. For Dry AMD there currently is not a treatment available. However, taking high levels of antioxidant vitamins has been shown to slow down progression of the disease. The recommended formula of vitamins is the Age-Related Eye Disease Study (AREDS) formula, which is available over-the-counter. Dry AMD can convert to Wet AMD at any time. 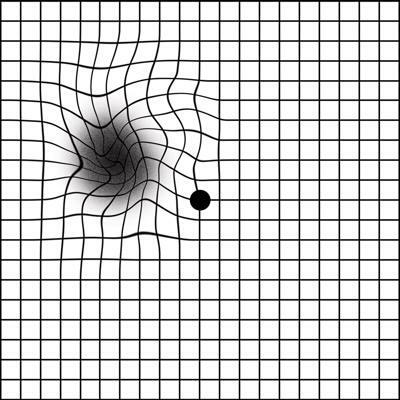 Therefore, all patients with Dry AMD should perform daily Amsler grid testing to check for any distortion or dark/blurred spots (pictured at right) that appear in either eye. If either of these appear, bleeding is likely and your retina specialist should be contacted immediately. Wet AMD treatments include laser and/or injections to reduce bleeding. As treatment is much more effective for early stages of Wet AMD, self- screening for visual changes and regular follow-up with a Retinal Specialist is critical. By far, the simplest and best plan for those with macular degeneration or those that suspect they might have it, is to have an eye examination first. Have a discussion with a Newsom Eye doctor about macular degeneration and what is right for you. Discuss AMD with a Retina Specialist, Contact Us Today to schedule an appointment! A macular hole is a small break or tear in the macula, the most light sensitive tissue at the center of the retina. 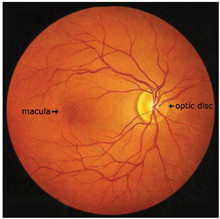 The macula is responsible for the most acute vision of the human eye. The most common cause of macular holes is the shrinking of the vitreous fluid which fills the inside of the eye. As we age this normally clear gel like liquid begins to shrink and as it contracts its fibers can remain connected to the retinal surface. As these fibers pull the increased tension can result in a macular hole. When the macula tears fluid can seep through the macular holes and into the macula, this usually results in blurring and distortion of the patients central vision. While most macular holes can be treated with surgery all cases will progress and may result in total loss of sight if left untreated. While macular holes can occur at anytime it is important to have your eyes checked regularly as early detection is key to affective treatment. Call Newsom Eye and let our doctors help keep your eyes healthy and strong for as long as you live. Most age related eye problems can be easily corrected or prevented with regular annual eye exams and honest self-screening. If you see a problem, see a doctor. Be Proactive, Have a Complete Eye Exam Annually! Macular Membrane or Macular pucker occurs when microscopic damage to the macula occurs and then heals. The resulting scar tissue creates macular pucker which can be similar although not a serious as macular holes. Macular pucker like a macular hole can result in distortion and/or blurring of the fine central vision. Macular pucker and macular holes are usually the result of the same thing a shrinking of the vitreous which causes a increased tension on the retinal tissue. When this tension creates minor damage which heals macular puckering is the result. Macular puckering will not usually develop into a macular hole. No matter what your symptoms or diagnosis the professionals at Newsom Eye will help you better understand your condition and the many cutting edge solutions available to you.